The arc of a public scandal — no matter what is involved — tends to bend in the same direction. First, there is discovery of a tawdry event. Then come the partial explanations. Some older folks might recall that “modified limited hangout” phrase. Then comes more disclosure. Maybe a new participant or a few new facts are uncovered. Denials ramp up. There is a defiant vow to fight to the end. Next, there are private discussions, agreements that maybe something had in fact gone amiss. Then, a secret plea deal is hashed out with prosecutors, followed by a public acknowledgement and a court date. Then, and usually only then, comes the resignation and apology. Now, to be fair, that arc occasionally bends in a different direction, toward exoneration. But it is rare. 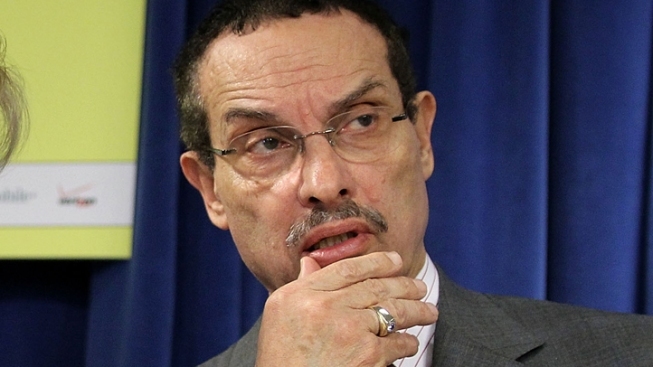 So where are we in the Mayor Vincent Gray “shadow campaign” scandal? However it turns out in the end — and we make no judgment here — we have entered the defiant stage. On Monday, D.C. Mayor Vincent Gray’s attorney told NBC4 that he was hoping that Gray would not be indicted in the shadow campaign probe but was prepared for it. In a brief telephone interview, attorney Robert Bennett declared that “if he does get indicted, he will go to trial and not make a plea.” Every other person caught up in this scandal so far has negotiated a plea deal. Bennett is a courtly but dogged defense attorney. He is polite beyond measure. He suffers reporter phone calls but rarely says anything unless it serves a purpose. His public comments Monday were his strongest yet in three years of scandal probing. Bennett also said he is upset with U.S. Attorney Ronald Machen. Bennett says Machen unfairly used a press conference about the long-running case to declare prosecutors were not finished, that other guilty parties should find their way to the prosecutor’s office. “We are not going away,” Machen said that day. Most everyone assumes Machen meant Gray. And all this is just weeks before the April 1 primary in which Gray is a nervous front-runner. Early voting started Monday. Here’s the rub. Last week D.C. businessman Jeffrey Thompson pleaded guilty in federal court on charges that he financed a $668,800 off-the-books campaign to help elect Gray in 2010. Several others have pleaded guilty in the conspiracy, but Gray had said he had nothing to do with the scheme. Thompson specifically testified that Gray had directly asked for about $400,000 in get-out-the-vote money. And Thompson, who once held millions in city contracts, said Gray knew that the money would be given secretly so as not to rile up then-Mayor Adrian Fenty. In the brief Monday interview this week, we asked Bennett a question that seems to strike at the heart of Gray’s situation: If the mayor is telling the truth that he knew nothing about the illegal shadow campaign, and is in fact a victim of the scheme, why hasn’t Gray rushed down to the prosecutor’s office to help convict Thompson? Although Gray has submitted various documents and Bennett has answered some prosecutor questions, Gray has declined to meet with prosecutors. Bennett likely doesn’t want his client subjected to questions Gray can’t answer. Gray could be standing firm, but the ground may be giving way. ■ Public verdict in? Recent public opinion polls are bad for Gray. Many voters say Gray has been a good mayor, but they can’t get past the shadow scandal. The most recent NBC4/WAMU/Washington Informer poll showed two-thirds of the voters want a new mayor, though they hadn’t settled on any one challenger. On Sunday night, candidates who are trying to defeat Gray drew another line in the sand. In response to a question at the Washington City Paper forum at the Black Cat nightclub, candidates Tommy Wells, Muriel Bowser, Andy Shallal and Reta Jo Lewis all said they would break with tradition and would not support Gray in the November election should Gray win on April 1. Candidate Jack Evans said he was a Democrat and always had supported the party’s nominees and would do so again — but his face didn’t look like his heart was in it. Now that voting has begun, the key questions are: Where are the voters’ hearts? And what more does the U.S. attorney have in store for us?